The Brown Cow Inn has long since ceased to trade as a public house and whilst it appears on early census records and mapping there is no mention of the Brown Cow after 1871 although the building itself still stands and has been extensively renovated over the years serving as a residential property today. 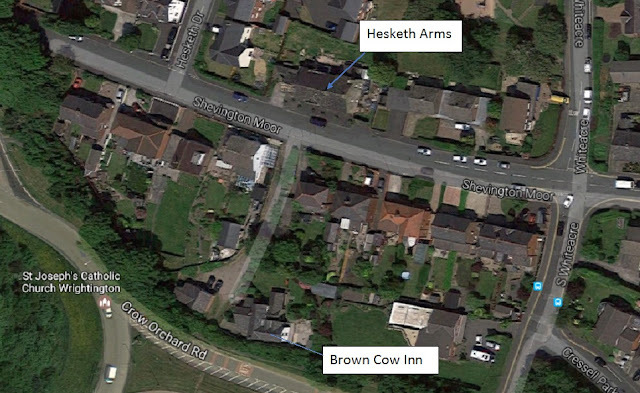 It can be seen below on an aerial photo from Google Earth pictured with the Hesketh Arms. 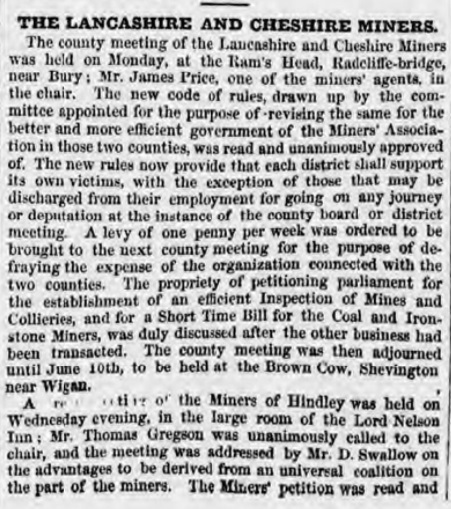 The first recorded meeting of the ratepayers of the `Township of Shevington' took place on the 31 st March 1852, in the house of Mr Hugh Woods. 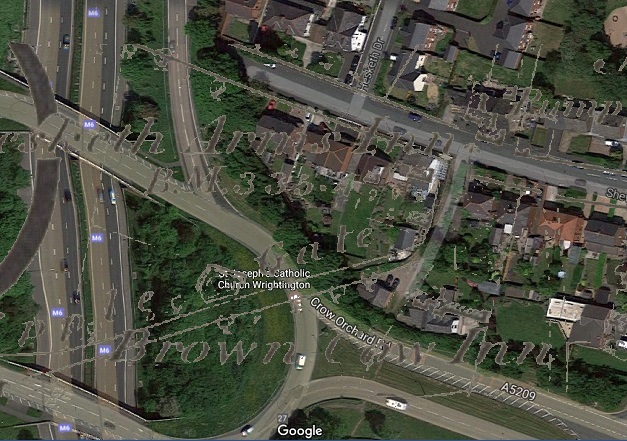 at the sign of `The Brown Cow'. 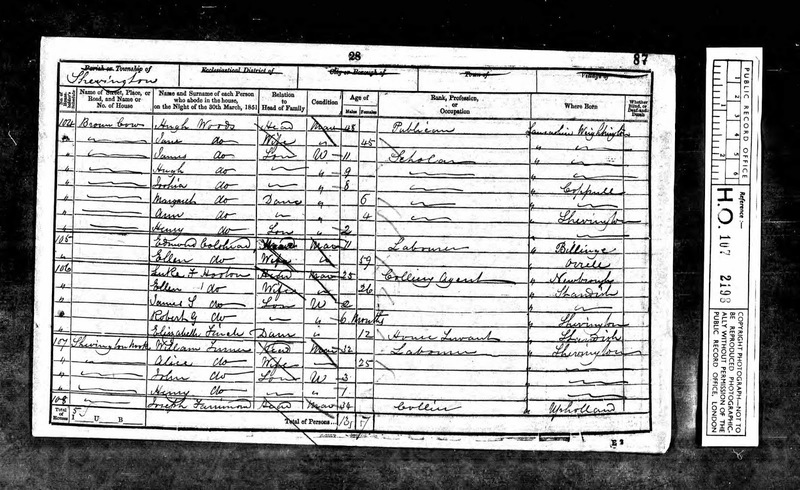 The business in hand was, `to make out a list of persons fit and proper to serve the offices of Overseers, Surveyor of the Highways and Assessors of Her Majesty's Income Tax'. The list was to be prepared and forwarded to her Majesty's Justices. 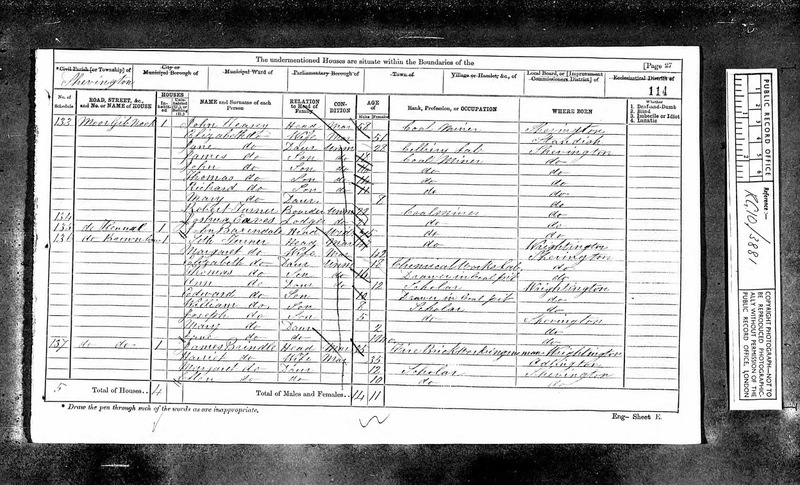 The first elected chairman was Mr. James Goben, and the Board members were, Mr. W. Stopforth, Stephen Richardson, Thos. Park, Luke Hooton, John Taylor, Ralph Orrell, James Orrell, Ellis Ambrose, and John Collier. Thos. 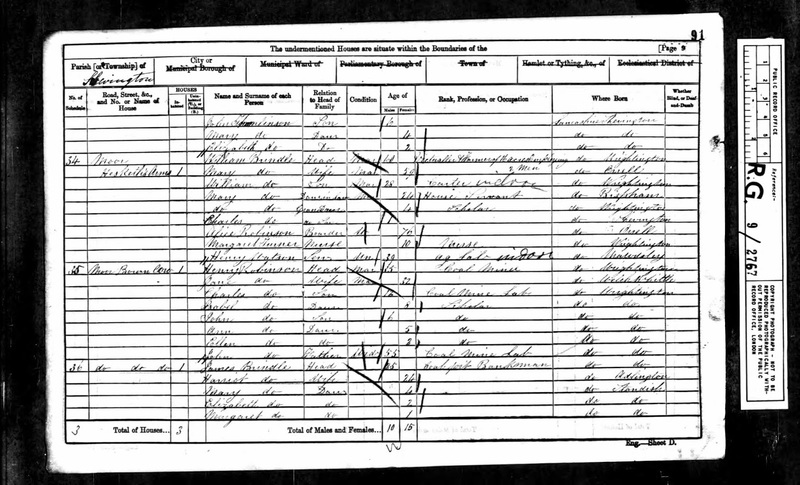 Hilton was appointed Highways Surveyor at a salary of £4.00 per annum, and James Goben was appointed Overseer of the Poor. Messrs Luke Hooton and Thos. Hilton were empowered to engage a mole catcher, at a salary of not more that £2-10-0d per annum. 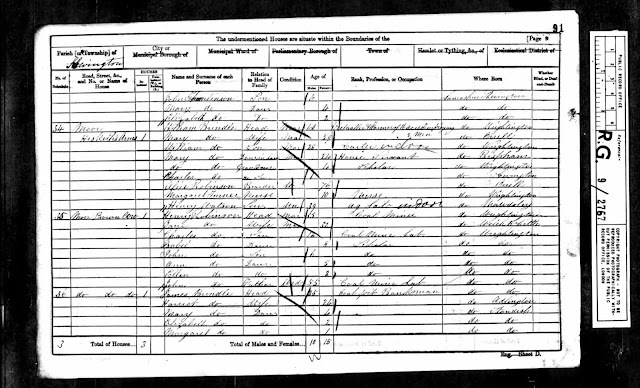 Although this is the first recorded meeting, the first few pages of the book are taken up with the Income and Expenditure account of `The Overseers of the Poor', in a/c with `The Township of Shevington'. 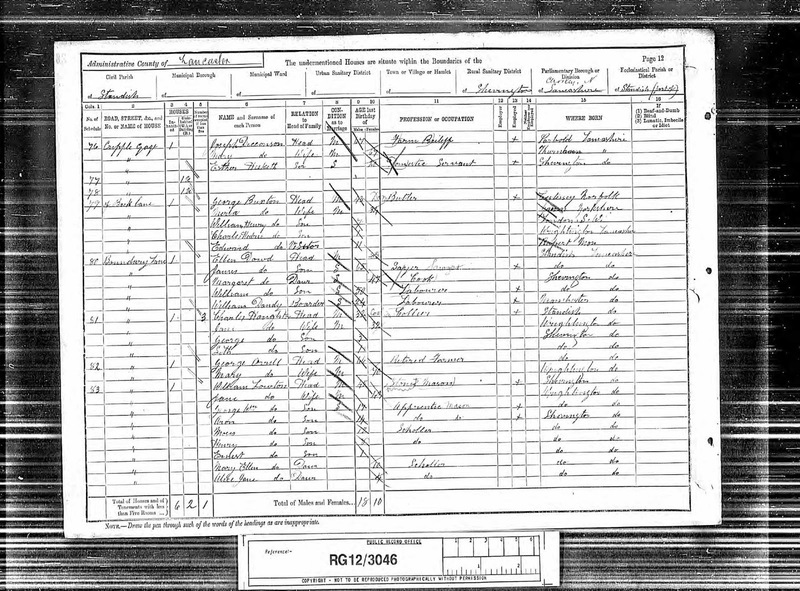 `The Overseers of the Poor', were known locally as the `Board of Guardians', or the `Local Board'. 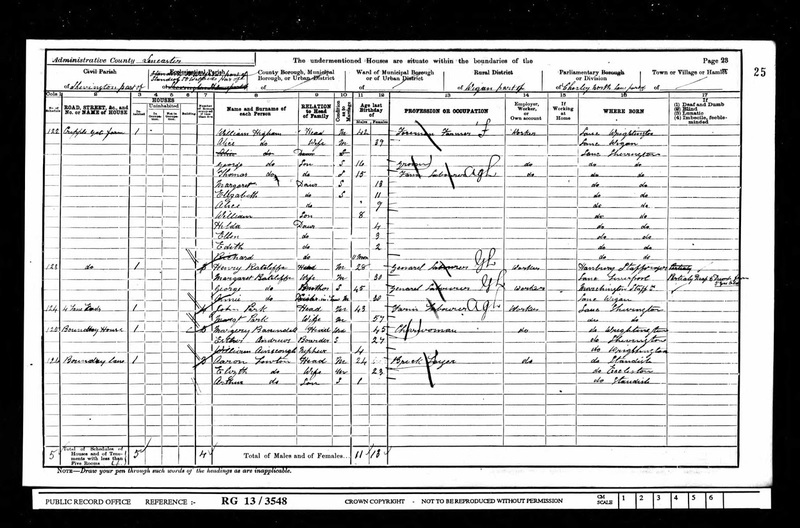 The last entry I 1848 shows that both income and expenditure has more than doubled. Some of the items of expenditure make interesting reading, viz. 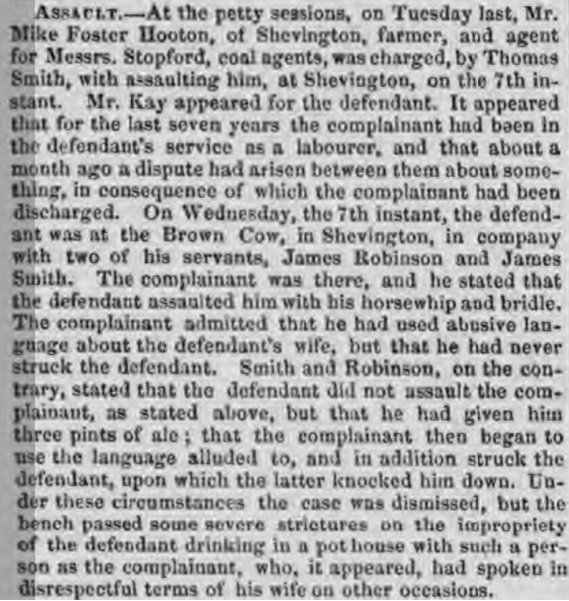 1/- for making oath to Lunatic List, 2/- for making oath to accounts, 6/- Journey to Preston with man accused of bastardy. Although the Board of Guardians were responsible for the collection and payments from the Poor Rate, and the upkeep of the Church School in Miles Lane, their powers were limited. The Church was still the dominant authority. 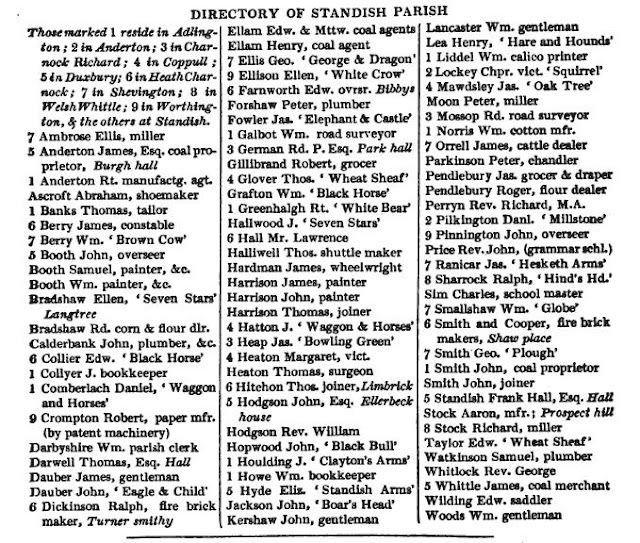 Permission to use the school, for Parish or public meetings must first be obtained from the Rector of Standish Parish Church. The second meeting was held at the house of Thomas Moorfield, at the sign of the 'Hesketh Arms' at Almond Brook, when Thomas Heaps was appointed `Mole Catcher' at a salary of £3.00 per annum. Each member of the Board signed the contract. Meetings were held once a year on what was apparently a rota system. 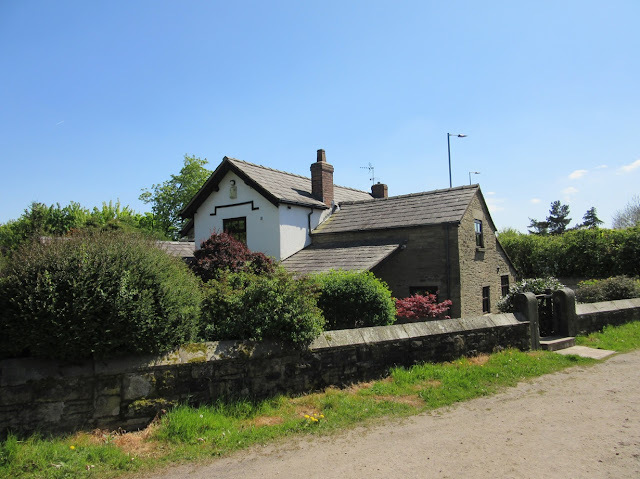 At the third meeting held at the house of Richard Stopforth, at the sign of the `The Plow' Shevington, mention is made of Will Yates, as being the Church Rate Collector. The first record of the Brown Cow is found on the 1824/25 Lancashire Baines Directory of the Standish Parish where a William Berry is listed as the landlord. 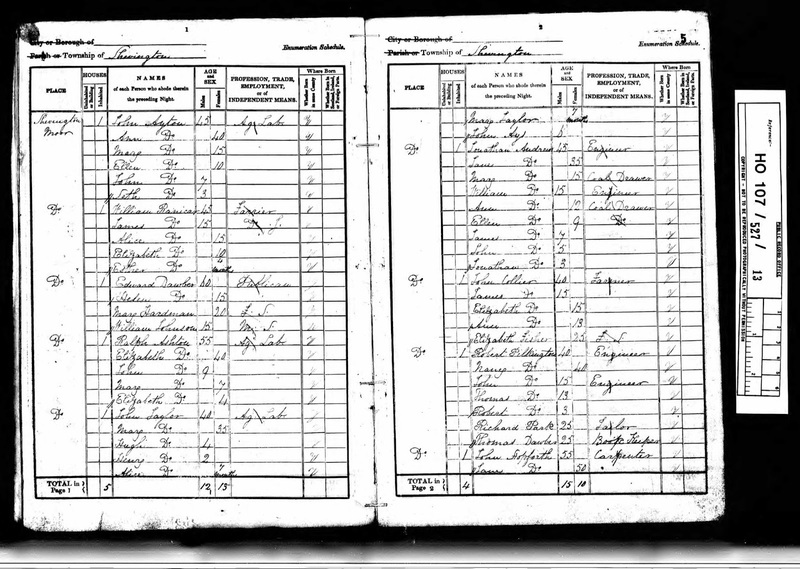 Whilst the Brown Cow is not listed by name on the 1841 census I strongly suspect that the beerhouse was being run by William Ranicar, shown on the census record above as a farmer. 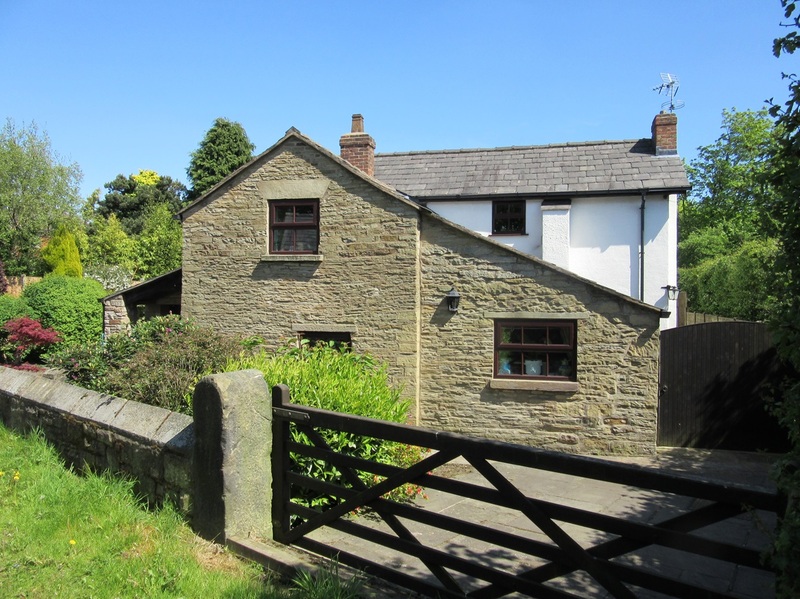 It was commonplace around this time for beerhouses to be run from working farms as a means of supplementing the income and this is likely to be the case here. 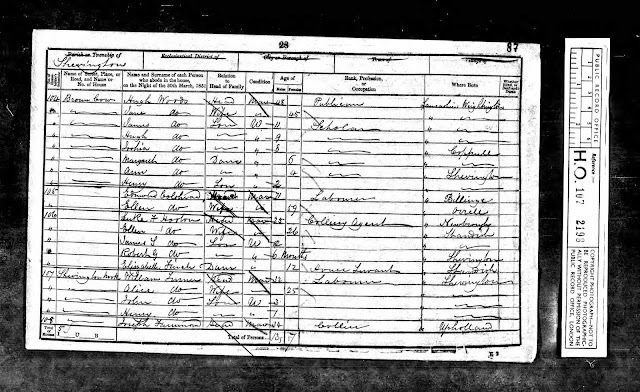 The Ranicar family were also a local family who went on to run the Appley Bridge Inn nearby from the late 1840s to the late 1870s (see the page for this pub on this blog - ran by James and Mary Ranicar). The Ranicar's property is also shown on the enumerator's route as being next door to Edward Dawber, who was the Innkeeper at the Hesketh Arms, which was the closest property at that time to the Brown Cow. 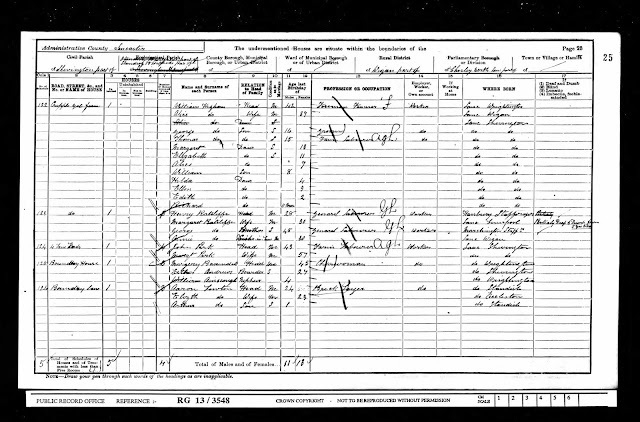 The Brown Cow was then listed on the 1851 census where Hugh Woods is recorded as a Publican as shown below. Records from 1861 and 1871 still record the name of the Brown Cow but there is no reference to it being used as an Inn. Located at the end of Cripplegate, which no longer exists the Inn was just a 100 yards or so south of the Hesketh Arms on Shevington Moor. 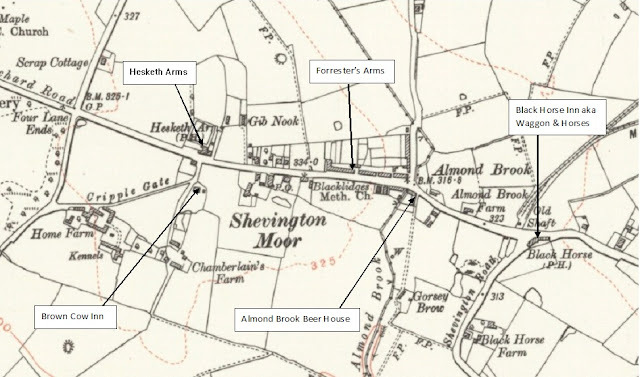 As the annotated map below shows, the Brown Cow was one of a number of beer houses within a stone's throw of each other in Shevington Moor in the 19th century.